Ready to escape? Still have questions? If you have any questions about planning a vacation to Paradise Island or would like to comment on my website, please e-mail me using the contact form below. Simply take a moment to fill out the brief form below. Please double-check to make sure there are no typos in the email address you provide. If you enter the wrong email address, I will not be able to reply to you. Your personal information, including your email address, is safe with me. I will never share this information with any third party. I will use it only to reply to you. I will do my best to personally reply to every e-mail within a reasonable period of time, usually within 48 hours. 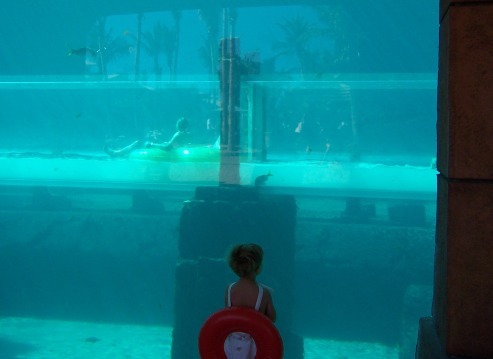 Watching riders on the Serpent Slide going through the shark tank at the Mayan Temple.